Birds Eye has revamped its on-pack Captain Birds Eye character as part of an overhaul of its brand identity, including a revised version of its logo that has moved from the side to the centre of its packaging. The Iglo-owned brand and design agency JKR have created an illustrated Captain Birdseye character, part of the brand’s £60m 'The Food of Life' brand relaunch, which kicked off earlier this year with a major ad push. 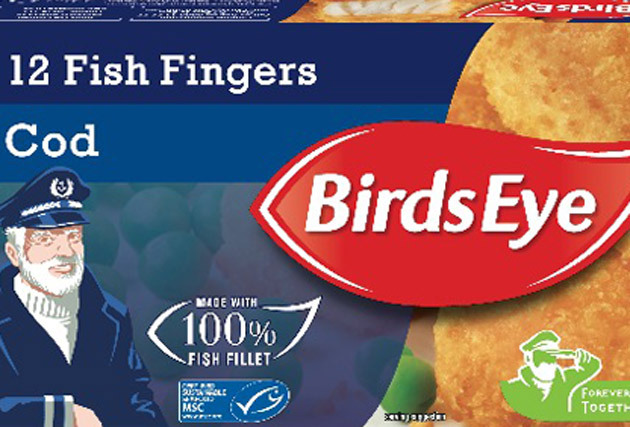 The new identity, which will hit shelves later this month on all Birds Eye products, spanning fish-fingers to frozen peas, has been devised to translate effectively into Birds Eye’s digital marketing, especially on social media. Cheryl Calverley, Birds Eye’s general marketing manager, said: "Our new packaging completes the update to our master brand and reflects our popular ‘The Food of Life’ campaign. "The refreshed packaging will help our products stand out on the shelves, as well as delivering in increasingly important digital environments." The Captain has been subject to various design and character changes over the years, having even been ditched by Birds Eye. Perhaps most infamously, the white-bearded Captain was replaced with a younger, dark-haired version 1998; but after consumers complained, the older version was brought back to represent the brand. Birds Eye has been investing large amounts of money in developing its brand, and differentiating it from rival products. This March Birds Eye kicked off its £60m pan-European relaunch campaign, with a spot by Havas Worldwide London featuring a modern family eating the brand's fish fingers and frozen peas.